More than two fifths of all card-present transactions conducted globally (42%) between July 2015 and June 2016 used the EMV chip card standard, up from 33% for the previous 12-month period, standards body EMVCo has revealed. In Africa and the Middle East, EMV transactions account for 90% of all card-present transactions — up from 84% in 2014-2015. In Asia, EMV transactions account for 58%, up from 34% a year previous, while 89% of all card-present transactions were EMV chip-enabled in Canada, Latin America and the Caribbean. EMVCo’s Europe Zone 1 region — broadly western Europe — maintained the highest percentage of EMV chip transactions with 98%, while Europe Zone 2 — broadly the CIS states and Asia — saw EMV transactions account for 75%, up from 65% in the previous year. “The progress of EMV chip technology worldwide promotes the implementation of an interoperable payments framework, supporting an advancing range of payment methods, technologies and acceptance environments,” says Soumya Chakrabarty, EMVCo executive committee chair. In the US, EMV transactions made up 7.2% of all card-present payments, up from 0.26% in the previous year. 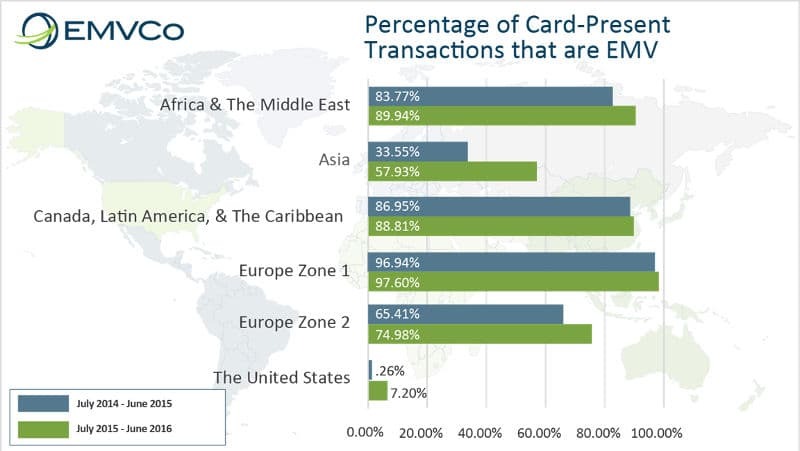 EMVCo reported in June 2016 that some 35% of all card-present transactions conducted globally between January and December used the EMV chip card standard, up from 32% in 2014. Not only are theproblems in the retail payment system not the fault of the EMV standard but it has the flexibility to address many of those problems. However, implementation in the US by the established brands within the standard has been little short of a disaster. Fortunately entrepreneurial alternative implementations of the standard will drive those implementations from the market place.